It wouldn’t be a picnic or backyard celebration at my house without a twist on the traditional. Coleslaw is one of those recipes that I could never get behind because most of the time, it’s this strange limp cabbage base drowning in mayo dressing. 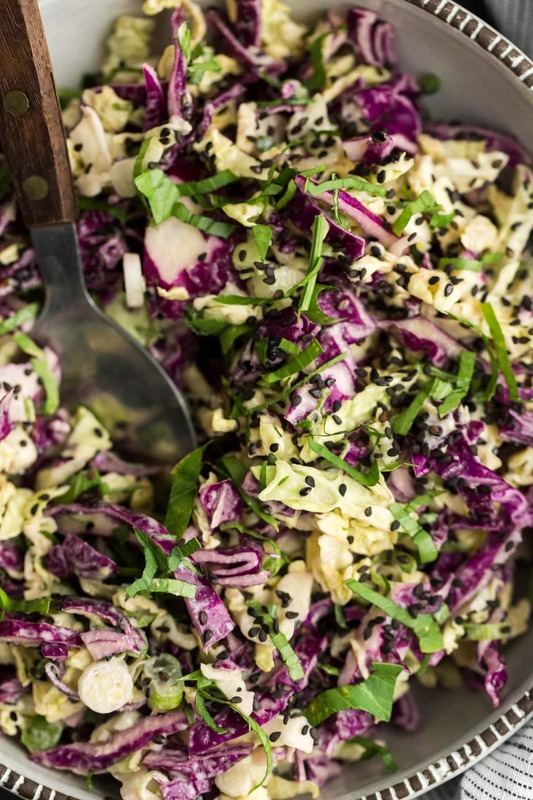 This tahini cabbage slaw is my answer to that. Not only is it vegan but using tahini gives it a nice sesame spin. I also like to use the black sesame seeds for a bit of contrast but feel free to use whatever sesame seeds you have on hand or can find easily. 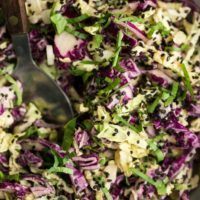 An easy vegan coleslaw using tahini in place of the more traditional mayo. Combine cabbages with scallions, parsley, and sesame seeds in a bowl. In a separate bowl, whisk together the tahini, lemon juice, olive oil, and salt. Pour over the cabbage mixture and stir until everything is well combined. Taste and adjust seasonings as desired. 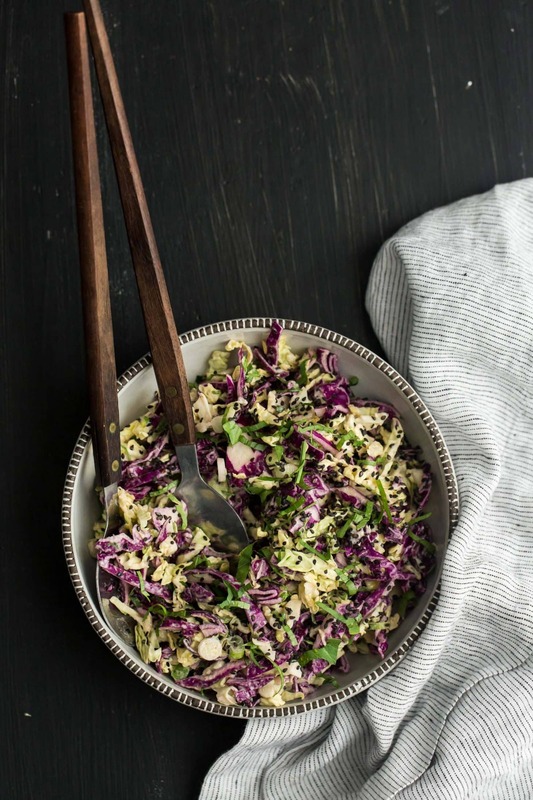 Tips & Tricks: I found the flavor of this salad to be better immediately after making, as well as the cabbage still being crisp. You can make it ahead of time but know the flavor will change. Greens: Shred kale, chard, or even collards and add to the cabbage. Shredded carrots can also be a nice addition. 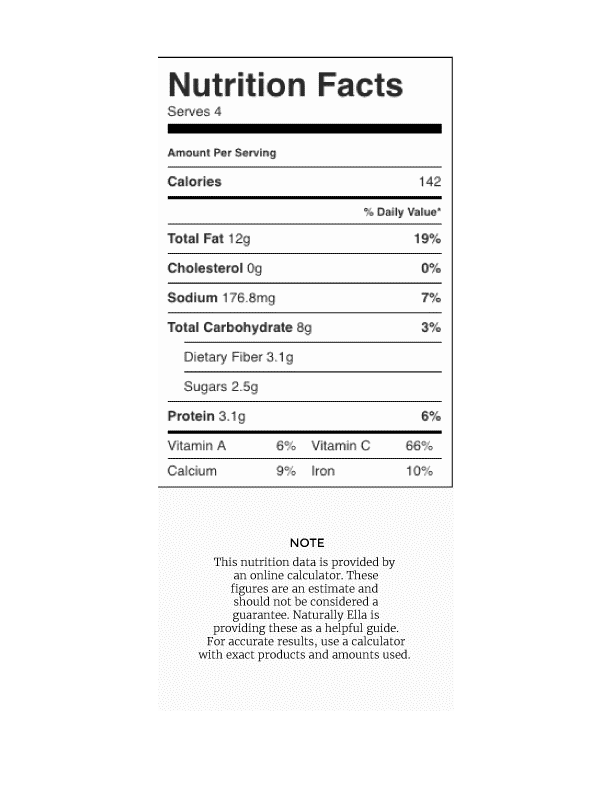 Sesame Oil: The overall flavor of sesame isn’t very prominent so if you’re looking for a serious sesame flavor, replace some of the olive oil with toasted sesame oil (roughly 1 tablespoon, but you could do both- taste and see what kind of flavor you like best). Herbs: I like to keep it simple with parsley but cilantro is also really nice in this dish. 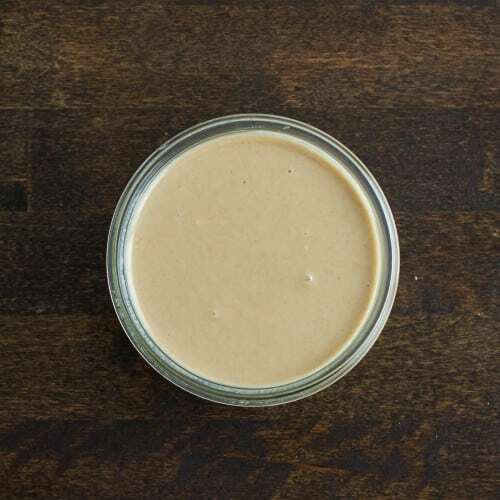 Tahini is one of those ingredients that you could easily buy in order to make hummus and then let it sit in your pantry until you were ready to make hummus again. That’s fine but tahini can be a great in sauces, dressing, and marinades. Need to pick up tahini? This is one of my favorite brands. Tahini has the best flavor ever! I can imagine how amazing it would taste with cabbage. I’ve tried it in other salads and it’s delicious! I also love the addition of the black sesame seeds on top! My dressing split. ? ? But flavour was lovely. ? Might have needed to whisk/shake it a bit more!